French Researchers: Hitler Really Did Die In The Bunker In 1945 : The Two-Way Conspiracy theories have abounded for years about the fate of the Fuhrer, ranging from his escape to Argentina aboard a German U-boat to living out his days at a secret Nazi moon base. 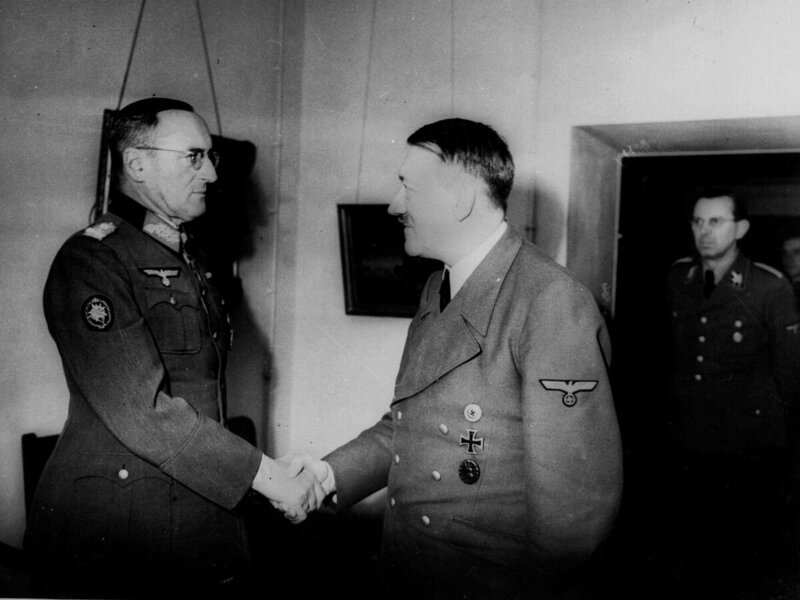 This is one of the last pictures taken of Adolf Hitler in his bunker in Berlin in 1945 as he shakes hands with General Field Marshal Ferdinand Schoerner. However, the history books have not satisfied everyone. Alternative notions have abounded in the tabloid press and even in some mainstream publications — most involving the Führer's escape from Germany at the end of the war. A team of French pathologists, publishing in the peer-reviewed European Journal of Internal Medicine, were recently allowed to study a set of teeth kept in Moscow since the end of the war. The remains had been taken from the Führerbunker by Soviet soldiers who uncovered the site where Hitler and his small entourage of loyalists spent their final days. It was there that SS soldiers set fire to the remains of Hitler and those of his longtime mistress-turned-wife, Eva Braun. It was the first time that researchers outside of Russia were allowed access to the teeth, which are held by Russia's intelligence service, the FSB. The researchers explain that Hitler had notoriously bad teeth and by the time he died, at age 56, only a few of his own remained. According to Deutsche Welle, "The teeth matched descriptions provided by Hitler's dentist and revealed no trace of meat — consistent with the fact that the Führer was vegetarian." The teeth were also readily identifiable because of "conspicuous and unusual prostheses and bridgework" described by Hitler's personal dentist, Hugo Blaschke, and his assistant, Kathe Heusermann, according to DW. "The teeth are authentic — there is no possible doubt," lead pathologist Philippe Charlier was quoted by Agence France-Presse as saying. "Our study proves that Hitler died in 1945." "We can stop all the conspiracy theories about Hitler," Charlier was further quoted by AFP as saying. "He did not flee to Argentina in a submarine; he is not in a hidden base in Antarctica or on the dark side of the moon." "The Nazis' development late in the war of high-technology weapons – including the V2, an early ballistic missile, and the Me 262 jet fighter – inspired some to believe that Germany had secretly won the space race. It was also suggested that the Nazis had made contact with UFOs and that they had made it to the Moon as early as 1942." UFOs and moon bases aside, several prominent Nazis did escape after the war, many of them finding refuge in South America, where right-wing regimes, such as Argentina, welcomed or tolerated them.